Ski-in / ski-out Log Slopeside Home - Considered the nicest rental at Schuss / Shanty... and in all of Michigan! Custom Luxury Home set in the woods directly on the Schuss Mountain Ski Hill and only a short walk from the Schuss Village pools, sauna, lodge with wireless Internet, restaurant, Cedar River Village and more. We’re within minuets of Shanty Creek's Legend and Cedar River's Tom Weiskopf golf courses. 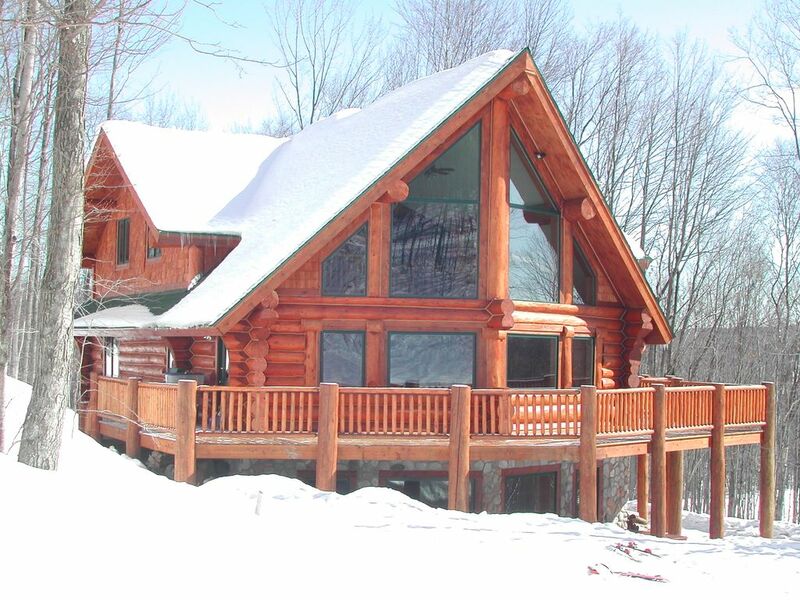 Three story, log home with 4 bedrooms, a huge loft (open style 5th bedroom), 3 & 1/2 baths with heated floors, sleeps 16. Enjoy our six-person outdoor Hot Tub. Master Bath and Walkout level bath both have jetted tubs. Large natural Fireplace! Heated Floors. Gourmet Kitchen. Outdoor fire pit. The open plan on the main level with vaulted living room, and fireplace, creates a warm and comfortable space for gathering. Relax after golfing or skiing in our 6-person hot tub below the large wrap-around deck overlooking Schuss Mountain's Chicken's Choice ski run. Amenities: Fireplace, Heated Floors (you're going to love this one! ), Air Conditioning, Golf & Ski Storage, Two Gourmet Kitchens with all necessities: microwave, dishwasher, coffee maker, all cookware and dishes, washer/dryer, linens and towels for baths and bedrooms, Satellite TV and DVD/VCR, BBQ gas grill, Great Views, Garage and storage areas. Cross-country ski trails, Downhill Skiing, Golf, and more. Flexible checkout times if available at nominal additional cost to get in that last hole of golf or final ski run. Mother Nature can dump lots of snow on the drive and area roads; 4WD is highly recommended if not required during the ski season. Avid skier, mountain biker, camper, sports car racer... overall adrenaline junkie! We built our dream log home right on the nicest ski hill in Michigan. Great for groups of people - especially if some ski and some don't; or if some golf and some don't; or if some want to sleep in and others are early risers... great home for friends and family to enjoy the beautiful Shanty Creek Resort - we overlook nothing except all of Michigan! Three and one-half custom tile / stone baths with heated floors! The upper-level master bath has a two-person jetted tub, two sinks, and a shower built for two in a luxurious room with heated floors. The main level has two more bathrooms: a full bath with very large shower, and a ½ bath complete with full-size washer and dryer. Both bathrooms have heated floors. The lower level bath has a full bath with jetted tub / shower combo. You will love the warm floors in the winter or on a cool night any time of year! The Schuss Mountain golf course can (sort of) be seen in the distance - down the ski hill. Directly on the Ski Hill. Best location in the resort. NO Phone - bring your cell phone. If you don't have a cell phone then rejoice in the solitude! Real wood burning fireplace in the great room. Also a nice fire pit out by the hottub next to the ski hill. WiFi Internet access in the main lobby of the resort. Tether your phone as well... great AT&T and Verizon coverage. Two complete kitchens! 'Home' size kitchen with island on main level and 'Condo' size (one wall) kitchen in walkout level. Great for entertaining large groups. Additional dining possibilities on the large deck just outside the great room / dining room as well as the four person dining / game table in the lower level. Private 6 person hot tub right at our home! Relax after golfing or skiing in a 6-person hot tub below the large wrap-around deck overlooking the Chicken’s Choice ski run. Warm up to the fireplace in the great room or make a fire in the outside fire pit. Swim indoors or out in the Shanty Creek resort pools at Schuss Village. We enjoyed the location! Right on the slopes but felt the owner was not on top of things regarding payments and repairs needed. Honesty and some refund for things that were not available would be preferred. It's a very expensive deal. I'm glad that you enjoyed the location of our slopeside ski home. Unfortunately, mechanical things do break; and, our hot tub had an issue. We immediately got a repair person out there, and ordered the necessary parts; however, were unable to resolve the issue during the weekend. Whenever there is an issue we always offer our guests compensation by way of discounted or free nights during their next stay. As 60+% of our guests are repeat visitors this seems to be working. Linda, we'll happily offer you one free night with any normal stay in the future. Again, sorry that we had a mechanical issue - but, this is beyond our control. Ski in ski out location was perfect. Driveway was a bit challenging. Thanks for the kind words. We’re glad that you enjoyed your stay. Absolutely beautiful, clean home! The three levels is a huge plus when living with other families and children. The property was amazing, and the bonfire area was great!! Close to Torch Lake also! The home had everything we needed and more. Plenty of room for our 4 family getaway! Inside was very comfortable, clean and homelike. We did have a few bug problems, ants and wasps but took care of that with available traps and sprays. Bedrooms and baths were all clean and well appointed. Hot tub while functional was only used once due to chemicals missing and the wasps. Our primary issue was the outdoor living spaces. Fire pit was unusable due to grass and weed growth as well as old broken furniture, part of which was placed in the fire pit, I guess that was a hint. Also, the deck was beautiful but no decent furniture to make it "liveable" to sit, relax or dine. Our secondary issue was the resort itself, this was no Crystal Mountain or Boyne. Both of these resorts are much nicer with upkeep, activities and amenities. Pool, unattended and small, was included but the fitness center was not. You couldn't walk or bike from the house due to the steepness of the driveways. Understood given its location but just FYI. With a few easy fixes, this could be a 4 or 5-star vacation property. Thanks for your kind words. I’m glad that you had a nice stay. Yes, the wasps and bugs were inhabitants well before the resort came or we built out home. We do our best to keep them away; but, that’s part of the price that one pays to be a part of nature. There should be backup hot tub chemicals in the garage and I’ve instructed my cleaning gal to ensure that they are more visible – in the outdoor ski storage lockers near the hot tub. Also in the garage are 16 or 18 brand new lawn chairs for use on the deck. Perhaps you didn’t look in the garage? We keep them there so that they don’t weather too quickly; however, next summer I’ll ensure that they are out on the deck “for the season”. Great input. It also may have been a bit since our outdoor maintenance team cut back the area around the fire pit. I only wish that you had phoned or texted me during your stay as I could have dispatched someone immediately. As to Shanty Creek being “no Crystal Mountain or Boyne” I would say that’s a point for discussion. Personally, I prefer the less congested, friendlier atmosphere at Shanty Creek and Schuss Mountain. Especially in the winter when we have no lift lines and one can wait for 15 to 30 minutes just to get up the ski hill at the “better” resorts. The pool, unattended and small, was, I hope, big enough to enjoy and less crowded. I don’t believe that any of our advertisements or the resorts indicate that the fitness center is included… Shanty Creek is more about the outdoor experience of Northern Michigan than hitting a health club. Our web site states several times that “4WD is required due to the steepness of the hill” so I’m not surprised that you didn’t want to bike down the drive; but, it’s very walkable for those in good shape. Again, thanks for your input; and, in the future, don’t be shy – we address all guest concerns immediately (during your stay). We had a group of 12 that stayed in this beautiful home Jan 4-7 and it was as advertised - "Nicest in Schuss Mountain" Our group enjoyed the access to ski slope, hot tub, heated bathroom floors, outdoor fire pit and proximity to Ivan's for apres ski activities. We would rent again without hesitation! Considered the best location at Schuss Mountain in the Shanty Creek Resort - Directly on the Ski Hill... Ski-in/Ski-out. Great Vista Views in this private wooded setting. Never get cold... the fireplace is nice even in the summer and the bathroom and walkout level floors are heated! Just a short walk to the Shanty Creek resort pool and Golf Courses. Once you stay in our ski-in / ski-out home you will never go back to off-mountain accommodations again. Allow the early birds in your group to get on the hill for first lift up while others sleep in. Stop by for hot coco or a dip in the hot tub between runs. Centrally located, Shanty Creek is only 20 minutes from Boyne Mountain, and 45 minutes from Traverse City. Enjoy a sunset over Torch Lake (only 15 minutes away and voted one of the ten most beautiful lakes in the world). Enjoy downtown Alden. Sail on Lake Bellaire, or collect Petoskey Stones on the Lake Michigan shoreline. Charlevoix is only 30 minutes away. Golf: Four golf courses in the Shanty Creek Resort: The Legend, Cedar River, Schuss Mountain and the Summit. Close to Boyne's Monument, The Bear, Hawkseye, The Chief and more. Ski: Ski-in / Ski-out home directly on Schuss Mountain's Chicken's Choice Ski Run. Best location in the resort; possibly the best ski home in Michigan! We make every attempt to keep this site up-to-date; however, prices are not guaranteed until confirmed. Weekends are three nights minimum - any booking that includes a Friday or a Saturday is a weekend. Additional nights (beyond three) are at our lower mid-week rate. Holidays are priced accordingly -- see our web site below or email for details. Holidays have minimum stays that might not be accurately reflected on the HomeAway site (due to their site structure). If so we will reach out to you before accepting your reservation. 3% convenience fee applied to PayPal bookings - the majority of our guests send a personal check to avoid the PayPal fees.